"The Rosetta Stone of Replicas"
© 2006-2010 Rosetta Classic, LLC. All rights reserved. 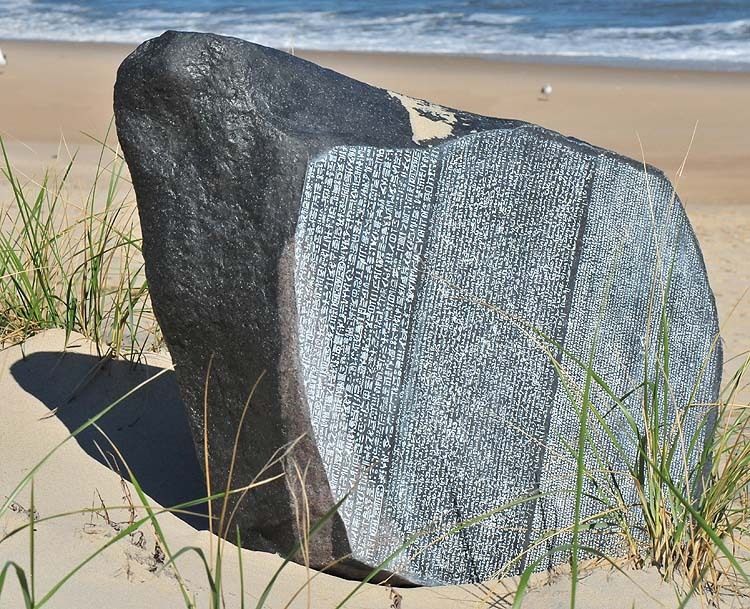 Full-scale replicas of the Rosetta Stone are now available thanks to a Severn resident. "I wanted to popularize the whole idea of the Rosetta Stone and bring it to the masses," said Joel Freeman, who spoke Wednesday about the Rosetta Stone at the Library of Congress. "I see it as a gateway to greater curiosity and greater understanding." The Rosetta Stone, discovered in Egypt by the French in 1799, was the key to decoding Egyptian hieroglyphics. 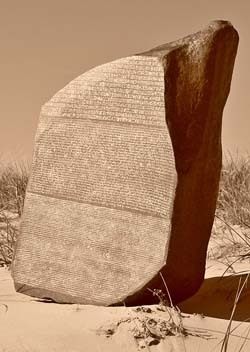 The Ancient Egyptian written language was lost by the time the stone, which was created in 196 BC, was discovered. "It enabled people who knew Greek to decipher the hieroglyphics," said Mary-Jane Deeb, chief of the African & Middle Eastern Division at the Library of Congress. "Since then, archaeologists have been able to read hieroglyphics on all ancient Egyptian artifacts." Freeman, an author, filmmaker and speaker, served as chaplain to Washington Bullets, later Wizards, from 1979 until 1998. It is here where his interest in African and Egyptian history really blossomed from talking to players. Just over four years ago, Freeman bought a replica of the face of the Rosetta Stone from an gentleman who purchased it from the British Museum. Later, he was able to get a digital image of the stone, which he said crashed a few computers because of the size. 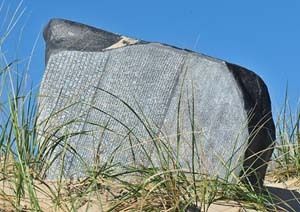 A sculptor created the sides and rear of the stone based on this digital image and other photographs. "People who have seen the real thing are astonished when they see the replica up close," Freeman said. "My goal is for millions of people to come touch this and be engaged." 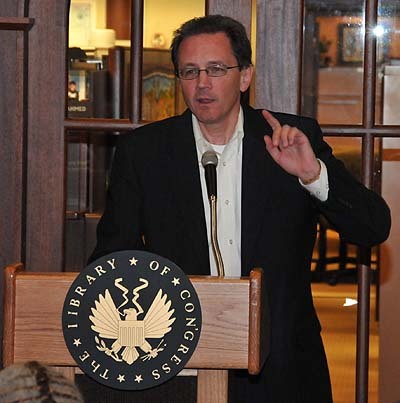 Severn resident Joel Freeman speaks at the Library of Congress in Washington about the Rosetta Stone. Freeman, an author, photographer and scholar of Africa history, just launched Rosetta Classic, which makes replicas of the famous archaeological find that cracked the code of ancient Egyptian hieroglyphics. He has already sold three of the "classic" replicas. They are to-scale replicas which weigh about 100 pounds and come with a base. The introductory price is available upon request. The Rosetta Stone was found in 1799 built into the foundation of an older structure on the west bank of the Nile as Lt. Pierre Bouchard was preparing the foundation for Ft. Julian. This images is designed to portray the Classic Rosetta model in an artistic manner. One replica is on a traveling exhibit in Australia and one has gone to a mold-maker in California. The third was delivered to the National Cryptologic Museum at Fort George G. Meade this week on a long term loan and will be displayed in the near future. He offers several other models, including a hybrid that can be used as a coffee table or wall ornament. The "lost wax" bronze replica is his finest offering and the most expensive. All of the models are manufactured on demand in Michigan by Mannetron. The original Rosetta Stone, a 1,700 pound, 45 inches tall, 30 inches wide and 11 inches thick slab of granodiorite rock, contained 14 lines of hieroglyphics, 32 lines of Demotic, another ancient Egyptian script, and 54 lines of ancient Greek when it was found. The original stone is on display at the British Museum in London. The stone spells out decrees of Ptolemy V, the fifth ruler of Egypt under the Ptolemaic dynasty. "The text on the Rosetta Stone gives us a glimpse into Egyptian life," Freeman said. "This was a gift … to the world." 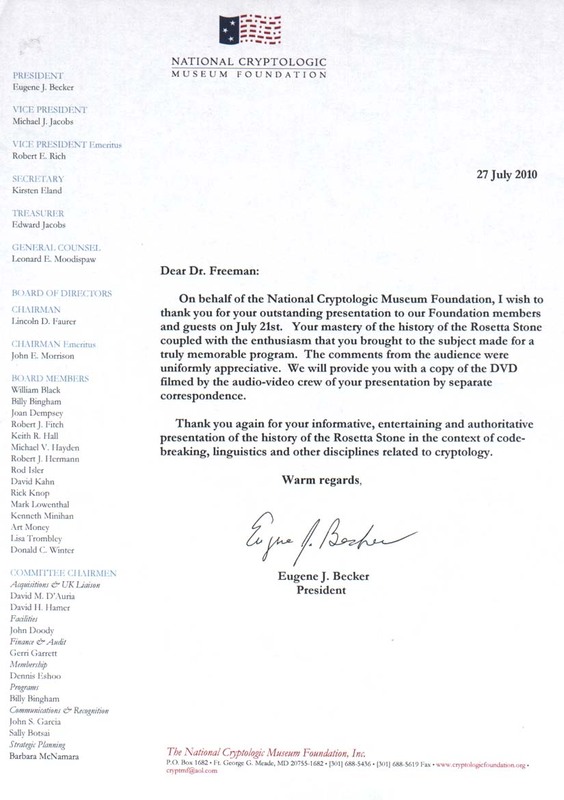 Dr. Joel Freeman delivered a talk on the Rosetta Stone as the speaker at National Cryptologic Museum Foundation's (NCMF) program on 21 July 2010. An extremely interesting, multi-talented individual, Dr. Freeman focused on the Stone’s history. He addressed how it was discovered and the extremely rich history of what it revealed. Created by a group of Egyptians priests to honor the Pharaoh, the text was written in three different scripts: hieroglyphic, demotic and Greek. Frenchman Jean-Francois Champollion finally managed to decipher the hieroglyphics in 1822. Dr. Freeman, a very dynamic speaker, adeptly tied-in the ancient stone’s discovery and decipherment with cryptologic, linguistic, and even computer quandaries of today. He also elaborated on the very complex, time-consuming process he went through to replicate the Rosetta Stone. His 3D, museum-quality reproductions were introduced at the Library of Congress in 2009, and have since been widely marketed to museums, foundations, etc.. Thanks to Dr. Freeman's generosity the National Cryptologic Museum has its own Rosetta Stone on display. Those of you who have not seen it are urged to do so. You will be amazed, and hard-pressed to differentiate between the replica and the real thing. (left) Dave D'Auria (NCMF) and Joel Freeman at the lecture event for NSA. (middle) Exhibit at the National Cryptologic Museum. 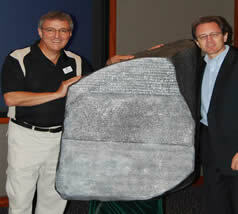 "Joel Freeman's presentation on The Rosetta Stone and the Breaking of Codes was outstanding! Everyone that I spoke to was very impressed and learned a lot! In addition to being an outstanding speaker in general, his subject knowledge and historical perspective, and the metaphorical connections he used for breaking codes and general problem solving would be a worthwhile topic to bring to a much wider NSA audience! Draw the bullseye around what you want the message to be and he will deliver. He can talk about the math and science of code breaking or expand the scope to the ethnic and/or cultural diversities resident then and how they affect society to this day." "I wholeheartedly endorse Dr. Freeman's replica as the only one (full size, 3D) I've ever seen available in the world, and with the research he has performed, has the best provenance possible. It should be in every university with an Egyptology Department, let alone in Egypt." -- Jonathan Downs, author of "Discovery at Rosetta"
In February of 2008, Joel Freeman of The Freeman Institute Foundation came to Direct Dimensions with an interesting project. 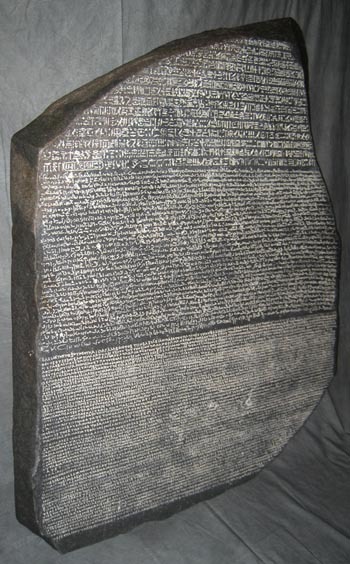 Within his collection of historical artifacts, Mr. Freeman owns an original replica of the Rosetta Stone, the famous tablet discovered after Napoleon’s 1798 conquest of Egypt. The tablet bears an inscription of a decree by Ptolemy V circa 196 BC, written in three different languages: two distinct forms of Egyptian hieroglyphics and one form of classical Greek. The Rosetta Stone was so important in the deciphering of some hieroglyphics that the term has come to mean any document or key instrumental in the decryption of a language or code. 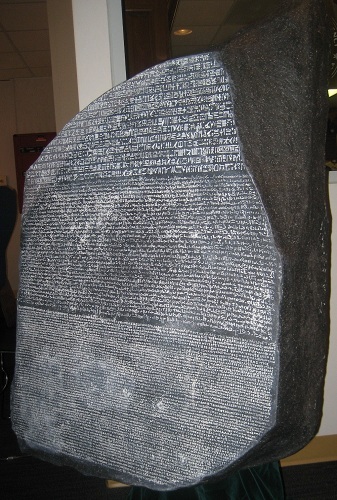 The original Rosetta Stone has been displayed by the British Museum since 1802, but a handful of first-generation castings were made of the tablet for reproduction in the 1970s. It was one of these original castings that Mr. Freeman brought to Direct Dimensions. He wants to make scaled reproductions and to help others understand the importance of this famous tablet. His cast reproduction is full-size, approximately 38-inches tall by 30 inches wide, made from black resin with the critical lettering inscribed on the flat front face. Because it is only a face casting that is two inches deep, this posed another problem, as he wished to make an accurate replica measuring the same 11-inch thick as the original tablet. After consulting with the engineers at Direct Dimensions about the project and understand how Mr. Freeman intended to actually fabricate the piece, it was decided that only an extremely accurate 3D digital model of this physical piece could work. The 3D data file would be used to drive a computerized industrial milling machine to carve a highly accurate mold. Direct Dimensions would have to use its most accurate and highest resolution scanning tool to capture the piece. Over the next several days at the DDI lab in Owings Mills, the cast replica was digitized using a non-contact laser line scanner mounted on a motorized precision coordinate measuring machine, or CMM. This unique scanning system had been integrated a few years earlier by the DDI engineers for projects just like this. With the controlled motion of the CMM combined with the scanner from Kreon Technologies, this system can achieve resolutions approaching 25 microns. This translates to 3D point every one-thousands of an inch (0.001”) - a dot per inch resolution sufficient for capturing even fingerprints in 3D. In addition to the precise scan of the tablet’s front face, a model incorporating the tablet’s true thickness had to be created. With standard photographs and other reference materials provided by Freeman, the digital modeling team at Direct Dimensions used a variety of software products, including PolyWorks, Geomagic, and Z Brush, to digitally sculpt the shape and contour of the original tablet’s back side. The back was then combined with the precise data from the front to complete the high accuracy digital model of the real Rosetta Stone. The final deliverable in polygon format will enable Mr. Freeman and his other collaborators to mill the completed replica molds. He aims to use his replica as a centerpiece in his educational programming, to be exhibited in the Black History galleries being developed by The Freeman Institute Foundation. 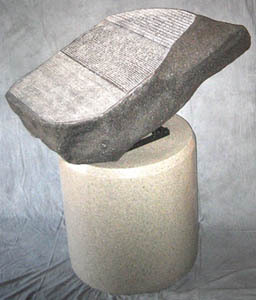 Rosetta Stone to any interested entity or individual – considered by some to be "the Rosetta Stone of replicas." Severn, MD – The Rosetta Stone. Anyone interested in the fields of archaeology, Egyptology, cryptology, publishing, geology, science, writing, mathematics, translation work and/or languages understands the significance of this famous artifact. Rosetta Classic®, LLC (in collaboration with The Freeman Institute® Foundation) announced today that for the first time any person or entity in the world can now own and exhibit a distinctive full-size, 3D Classic Rosetta replica (45” tall x 30” wide x 11” thick, 95 lbs) of the original Rosetta Stone, housed in the British Museum. Rosetta Classic is not affiliated with the British Museum, which has not endorsed or sponsored Rosetta Classic, The Freeman Institute Foundation, or the Rosetta Stone replica project. The Hybrid Rosetta model is also available to the general public. 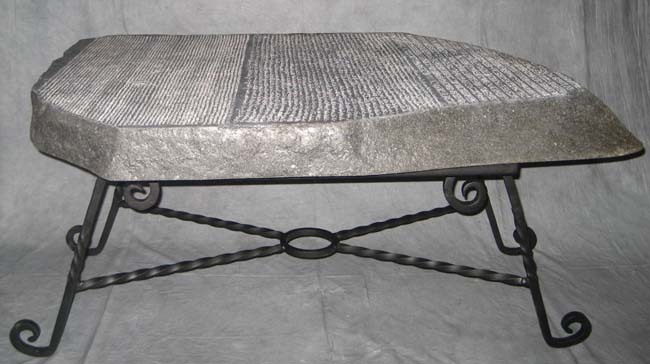 It’s a coffee table (40" long x 30" wide x 2.5" thick), made in the shape of the face of the original Rosetta Stone, features four removable legs, allowing its owner to display the model either as a coffee table or as a piece of wall-mountable archaeological art. To our knowledge, it is the world’s first and only such dual-purpose innovation. The world’s first and only Limited Edition models are the Classic Fine Art Bronze Rosetta (“lost wax” bronze full size, 3-D replica), Bronze/Silver Rosetta (cold bronze/silver full-size, 3-D replicas in a durable resin compound), and the Bronze Plaque Rosetta ("lost wax" full-size flat bronze or cold bronze/silver plaque models, approximately 40" tall x 30" wide x 1" thick). On Wednesday, October 14th, 2009, Dr. Freeman will be speaking on the topic at the Library of Congress (DC) at 12 noon in the African & Middle Eastern Division. He will be exhibiting a full size replica, along with a few other innovations and some of the historical items (early 1800s) from his collection. It's free. All are invited. C (1). CLASSIC ROSETTA: info/pricing -- Classic Rosetta -- PICTURED ABOVE...available! the shape and the coloring of the genuine Rosetta Stone. White lettering for ease of reading. (2). CLASSIC BRONZE ROSETTA: info/pricing -- Classic Bronze Rosetta -- available! limited edition (only 950) full-size, 3-D cold bronze model (resin & bronze). Black lettering. (3). CLASSIC SILVER ROSETTA: info/pricing -- Classic Silver Rosetta -- available! limited edition (only 950) full-size, 3-D cold silver model (resin & silver). Black lettering. 2/3 size, 3-D replica (approx. 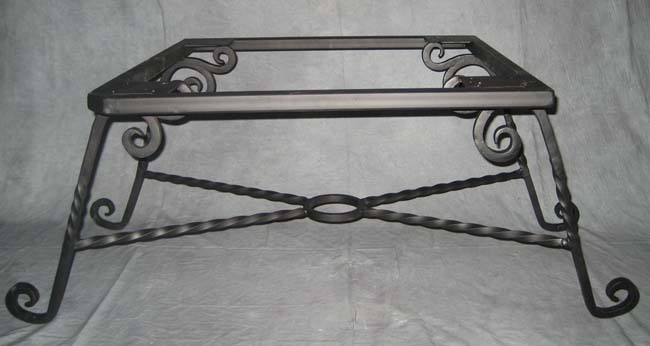 30" high x 20" wide x 7.5" thick). Perfect for exhibition in your home. and now you have a beautiful piece of archaeological art to hang on your wall. White lettering. * "Cold Bronze" Plaque Rosetta (with black lettering) -- available! * "Cold Silver" Plaque Rosetta (with black lettering) -- available! * Classic Plaque Rosetta (with white lettering) -- available! HYBRID ROSETTA -- One moment it's a coffee table. The next moment it's fine art for your wall! "cryptology -- Nile -- archaeology -- basalt -- hologram -- holographic -- language -- translation -- Egyptology -- publish -- artifact -- artefact -- granodiorite -- wall art -- coffee table -- copy"
"Rosetta Stone -- full size -- Egypt -- Jean Champollion -- hieroglyphics -- Cairo -- British Museum -- replica -- facsimile -- copy -- life size -- reproduction -- rare documents -- 3-D -- 3D -- museum -- gallery"